A Wanted Awakening are a melodic death metal band from Lowell, Massachusetts (USA). The guys formed in 2002 in Florida, under the name Atlas Dying. After line up changes and moves across the US, they changed their name to A Wanted Awakening. A Wanted Awakening are Rick Hardy on vocals, John Tree on guitar/vocals, Derek St. Martin on guitar, Jason York on bass/vocals and Evan Carney on Drums. The bands EP - Rebirth was released back in April of this year. It contains five tracks of modern, but progressive death metal. Flameborn is the EP's first track. The songs off-kilter riffs and good range of vocals, including the clean singing, show the bands varied influences and shows off their musicianship really well. The twin guitar harmonies and guitar solo adds more too their sound, and unlike most other modern "deathcore" bands, they don't overfill it with breakdowns. Misanthrope begins with a Middle Eastern intro, before launching into high-pitched growls. The singing again doing a good job of balancing out the bands brutality. The adept rhythm section helps to underpin the rest of the band and the almost Hispanic instrumental passage mid-way through the song again highlights their skillful musicianship. The Massacre to come is a more straightforward death metal song, The deeper growls juxtaposing the higher pitched screams. It also good to see that where they employ cleanly vocals, they are not overused and don't come across as cheesy. Fourth track, Spiders, includes highlights the bands ability to change the pace of their music with ease and the epic metal riffs make the song more of an uplifting experience, which is not something you often hear about death metal. Final track, The Persues Veil, starts off with the rhythm section going at breakneck speed. The band unleashes an epic final guitar solo on the listener, and even drops in a jazzy instrumental passage midway through the track. Overall , Rebirth is well produced and each instrument is allowed to breath in the mix. It shows the bands musicianship and influences off well. The songs are not overly long and that's good, because they don't lose the listener like some bands do. Considering there are so many bands peddling US death metal and metalcore influences at the minute, it can be tough to stumble across a band which sounds genuinely exciting, but with A Wanted Awakening, you need not search any longer, because these guys have a bright future ahead of them! The guys have streamed the Rebirth EP on their Bandcamp page. I've attached it here for you to listen to. Also, make sure you check out A Wanted Awakening's Facebook page at - http://www.facebook.com/awantedawakening for news and tour dates. You can also checkout their merch at http://awantedawakening.bigcartel.com. Okay, so I haven't been to active recently due to some strange circumstances, but now I'm getting my act together and am gonna start doing some new posts, so watch this space! My first post is on a demo by a band I've been aware of for a while, so I thought it'd be a good place to start. Malfeitor are a Swedish death metal band, featuring members of other cult bands Excruciate, Exhumed, Mastication, Morpheus, Stigmata and more. Malfeitor is made up of Benny Moberg on guitar, Mattias Parkkila on vocals and Janne Rudberg Björkenfjäll behind the kit. Benny and Mattias formed Malfeitor in 1990 and were active until 1995, when they then went onto other active projects, before reuniting in 2010. Janne joined them in 2011 and when onto to records this demo with them. Their recent demo - To Hell, Farewell, is not you're typical swedeath demo. The band make use of both fast paced and slower sections, with evil low end growls and screeching guitar solos. The demo is made up of six tracks. The first track Beyond the Horrrorizon sets Malfeitor's stall out early, it's fast, evil but subtly different to most of the swe-death you hear at the moments. The screams of "die f-ing die!" shows that there might even be some black metal in their music as well. Second (and title) track To Hell, Farewell goes straight for the jugular with razor riffing and machine gun blastbeats. There is a certain element of black metal in the growls and a good almost symphonic atmosphere, but without being pompous. Third track Death, the dead and me build slowly with an almost doomy intro before launching back into a ferocious stride. Malfeitor seem to groove more on this song, but only for a short time, but it shows that they are not scared to vary their sound. Fourth track Scenes from a slaughterhouse, is very much an old-school death metal song, including a screeching solo and the use of changing time signatures to build atmosphere. The fifth (aptly named track), And the sky turned to rage, is chaotic and finishes with a flurry of off-kilter riffs and blastbeats. Bonus track The Pain Collector, is the final ferocious bite of the cherry for Malfeitor on this demo. The deep vocals and never ending blastbeats added to the old-school solo gives the listener one more morsel of their brand of death metal, before the demo ends. It's the longest track on the demo and sees Malfeitor trying out a few extra sounds, to add texture to the track. 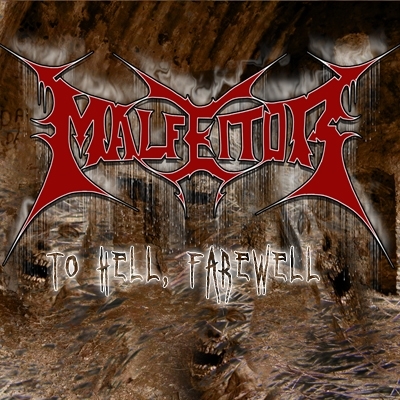 Malfeitor have a video up on Youtube as a teaser to the release of the demo on tape. Go to http://youtu.be/igp8sj_Twp0 two view it. 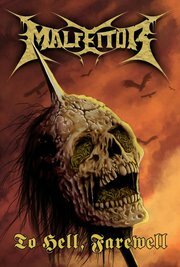 You can also find out more about the band on their Metal Archives page at - http://www.metal-archives.com/bands/Malfeitor and also on Facebook at - http://www.facebook.com/MALFEITOR666. There may be a lot of bands peddling the death metal sound at the moment, but each one has a signature or something that stands them apart from other bands, and Malfeitor are no different. I'm excited about what is to come from them and will keep my eyes peeled, as should you! Due to personal circumstances, I have decided to put Stay Ahead blog to sleep for while. This is not a decision I have takne lightly, but I have some things coming up that take a lot of time to sort out regarding my job. I want to apologise to the bands that I was due to feature and I will eventually awaken it. Thank you for your understanding and patience and please bear with me.